You do very beautiful work Tim.. Im always very impressed everytime I visit your website..
Steel Panels - Hi there,love the look of the rusted steel in the garden. Is it a particular type of steel sheeting and thickness? Hi Brendan. This is sealed mild steel 5mm thick left to rust. Hello. I am wondering, what is the retaining wall behind the steel constructed of, & how is the steel fixed to it? 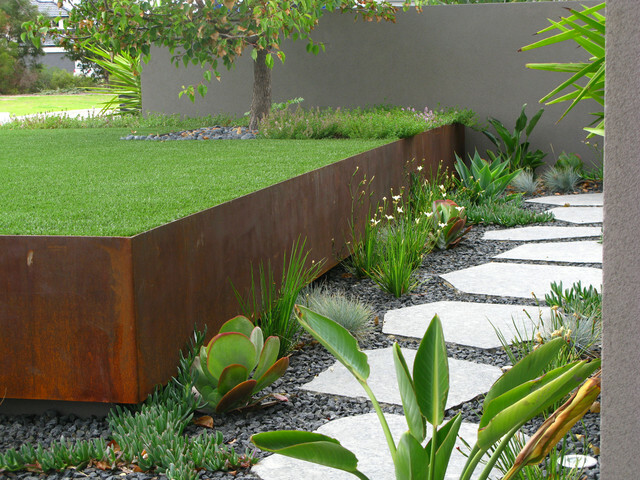 Its good looks make Corten an attractive material for retaining walls, too. 3. How far apart?Harrison advises stepping out the placement of stepping stones before you install them. “There’s nothing worse than steppers placed too close together, so you end up shuffling along the pathway,” he says.TIP: The average person’s stride is about 45cm. If this is the case for you – and the people who will most often be walking the path – place each stone so the centre of each stone is 45cm from the centre of the next. Mark the centre point with spray paint, a tent peg, or similar. 9. Retaining wallsRetaining walls don’t get much love either. They’re certainly not as interesting as kitchens and custom joinery units; however, they still need consideration during the design stage so that they can be quoted on, because no matter how much we ignore them, they aren’t going to build themselves. For any block with even a modest slope, you (and ideally your designer) will probably need to put some thought into the location, height and type of retaining walls. It is not uncommon for builders to exclude retaining walls from their quote as they are often considered to be landscaping items; however, I believe them to be an integral element of the building site as a whole. 8. Connect different areasOnce you’ve worked out where all the key parts of your garden will be, you need to connect them to each other and the house. Deciding what materials you use for paths can be determined further down the track, unless perhaps you are building your house and want to pour concrete for floors and footpaths at the same time. Don’t leave it to the end to think about paths and don’t skimp on them, either. Remember that cheaper materials such as stepping stones, pebbles or even bark can be used for minor routes that are not used often. Take inspiration from this stepping stone path created by Tim Davies Landscaping for a Perth garden. I do not mind this color scheme. Would like steps slightly darker but not as dark as stones/gravel obviously.